WASHINGTON, DC -- The US military has for weeks been training Ukrainian forces in US tactics, but the commander of US Army Europe says Ukrainian forces, who are fighting Russian-backed separatists, have much to teach their US trainers. 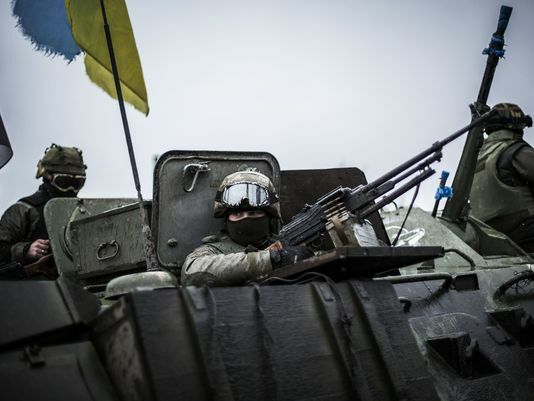 Ukrainian soldiers man an armoured vehicle near the city of Artemivsk, in the Donetsk region, in February. Ukrainian forces have grappled with formidable Russian electronic warfare capabilities that analysts say would prove withering even to the US ground forces. The US Army has also jammed insurgent communications from the air and ground on a limited basis, and it is developing a powerful arsenal of jamming systems, but these are not expected until 2023. "Our soldiers are doing the training with the Ukrainians and we've learned a lot from the Ukrainians," said Lt. Gen. Ben Hodges. "A third of the [Ukrainian] soldiers have served in the ... combat zone, and no Americans have been under Russian artillery or rocket fire, or significant Russian electronic warfare, jamming or collecting — and these Ukrainians have. It's interesting to hear what they have learned." Hodges acknowledged that US troops are learning from Ukrainians about Russia's jamming capability, its ranges, types and the ways it has been employed. He has previously described the quality and sophistication of Russian electronic warfare as "eye-watering." Russia maintains an ability to destroy command-and-control networks by jamming radio communications, radars and GPS signals, according to Laurie Buckhout, former chief of the US Army's electronic warfare division, now CEO of the Corvus Group. In contrast with the US, Russia has large units dedicated to electronic warfare, known as EW, which it dedicates to ground electronic attack, jamming communications, radar and command-and-control nets. Though Ukrainian troops lack the materiel to protect themselves from this form of attack, the Ukrainian military's institutional knowledge as a former Soviet republic will help it understand how Russia fights, and its troops will have trained to operate while being jammed, Buckhout said. That's something US ground forces can learn. "Our biggest problem is we have not fought in a comms-degraded environment for decades, so we don't know how to do it," Buckhout said. "We lack not only tactics, techniques and procedures but the training to fight in a comms-degraded environment." It's not hard to see why EW is an attractive option for Russia while the eyes of the world are on it. Not only is it highly effective, but as a non-kinetic form of attack, it is harder to trace and less likely to be viewed as overt aggression, and as such, less likely to incite the ire of the international community, Buckhout said. In a fight, Russia's forces can hinder a target's ability to respond to, say, an artillery attack, allowing them to fire on an enemy with impunity. Ukrainian forces would be unable to coordinate a defense against incoming rockets and missiles, or release counter battery fire. "If your radars don't see incoming fire, you can't coordinate counterfire," Buckhout said. The US, Buckhout said, lacks a significant electronic attack capability. "We have great signals intelligence, and we can listen all day long, but we can't shut them down one-tenth to the degree they can us," she said. "We are very unprotected from their attacks on our network." Col. Jeffrey Church, the Army's electronic warfare division chief, acknowledged that since the Cold War, adversaries have continued to modernize their EW capabilities, while the Army began reinvesting its capabilities for Iraq and Afghanistan. Church called the fielding of Army electronic warfare equipment the "No. 1 priority" of his job. "The Army must have electronic warfare capabilities that could be used to dominate key terrain on the electromagnetic spectrum against any adversary," Church said. A developing Army program, Multifunctional Electronic Warfare (MFEW), is intended to provide an offensive electronic attack capability, able to jam cell phone, satellite and GPS signals, said Lt. Col. Gregory Griffin, chief of the Electronic Warfare Division's programs and requirements branch. However, the focus had been until recent years on "defensive electronic attack," namely counter-radio-controlled-IED devices that create bubbles of protective jamming around vehicles and people, and signals collection for intelligence purposes. The Army has demonstrated some ability to counter enemy communications, not under formal acquisitions programs but as quick-reaction capabilities. In Afghanistan, the Army used a handful of C-12 aircraft equipped with Caesar jamming pods to jam insurgent push-to-talk radios, and two fixed-site systems — Ground Auto Targeting Observation/Reactive (GATOR) jammer and Duke V2 EA — to jam radios and repeater towers. On an ad hoc basis, troops in Afghanistan used GATOR — conceived to protect forward operating bases — to suppress repeater towers while on patrol or training Afghan forces, providing themselves the freedom to maneuver while denying communications to potential enemies, Griffin said. "It was unlimited capability, limited by the number of systems," Griffin said. "Honestly, we just did not have enough to support the demand that was in the Army." The Army's electronic warfare cadre, which totals 813 officers, warrant officers and noncommissioned officers, has wielded more theory than hardware, except when deployed. In garrison, it was common for these troops to be assigned other jobs, leading to the joke that EW stands for "extra worker" — though this is changing as the Army ramps up its electronic warfare materiel strategy, Griffin said. MFEW, due to reach initial operating capability in 2023 and full operating capability in 2027, is intended to offer a suite of powerful, sophisticated sensors and jammers for in the air, on ground vehicles and in fixed locations. The Army is due to consider a capability design document for the "air large" capability, akin to Caesar, potentially for a C-12 or a MQ-8 Fire Scout drone. Last year it tested the Networked Electronic Warfare Remotely Operated (NERO), a jamming pod attached to the Gray Eagle drone. The Defense Department in March set up a panel to address its electronic warfare shortfalls, which, Griffin said, has generated discussion about accelerating the timeline for MFEW. Forces with US Army Europe have for the last 10 weeks been training three battalions of Ukraine Ministry of the Interior troops, known as Ukraine's national guard. The second cycle of that training was paused so that troops could participate in a combined multinational exercise, underway through early August, and it will resume and conclude with the third battalion in August. The Ukrainian military — which is in the midst of a reform and modernization effort even as it wars with Russia — has shown interest in creating a noncommissioned officer corps modeled after that of the US, Hodges said. Ukrainian military officials charged with reform efforts visited Washington in recent weeks and, in a press conference, acknowledged the challenges of corruption and shoddy soldier equipment, which they sought to correct. But Konstiantyn Liesnik, an adviser to the Defense Ministry's reform office and head of its working group for logistics and procurement, noted the US military's experience in recent years has concerned insurgents in Iraq and Afghanistan, not a powerful, organized and well-equipped adversary like Russia. "The future of war is in Ukraine, and I think in this case our experience is very important to US personnel how war should be in this century and next century," Liesnik said. Beyond electronic warfare, Russian anti-aircraft rockets have prevented Ukrainian forces from using their airplanes, and it has had to consider personal armor that can protect against artillery. Ukrainian forces interacting with US soldiers have spoken frankly about their difficulties, something Hodges said he saw firsthand when the chief of the Ukrainian Army, at an event attended by senior leaders from other countries, discussed with a group of officers his force's battlefield experiences and shortcomings. "I have been very impressed with the earnestness of the Ukrainian military to fix their shortcomings and improve their capabilities," Hodges said. "It was one of the most professional things I have ever seen of any army, and they were very candid: We were not prepared to do this, and here's how we adapted." Ukrainian troops have not only had to adapt to Russian electronic warfare, but its artillery and unmanned aerial systems. A senior Army official, Hodges said, detailed how unprepared Ukrainian troops have been for the number of casualties and their treatment. The US provided Ukraine with lightweight counter-mortar radars in November 2014, which Hodges said its troops have "used in ways we have not used it ourselves, and made it more effective than we thought was possible." These troops, he said, would be savvy enough to operate a more advanced radar with a wider range — which the Pentagon is reportedly in talks to send. An official at the US State Department said the administration believes there is no military resolution to this crisis, but Ukraine has the right to defend itself. To that end, it announced a $75 million Defense Department aid package in March that includes 30 armored Humvees, 200 other Humvees, radios and unarmed surveillance drones, night-vision devices and medical supplies. The 173rd Airborne Brigade Combat Team, based in Vicenza, Italy, had been training Ukrainian troops in western Ukraine, in battlefield medicine, casualty evacuation, and tactical tasks such as anti-roadside bomb techniques and basic battlefield movement. Saber Guardian, a command post exercise which rotates between Ukraine, Romania and Bulgaria, this year was linked to Rapid Trident, an annual field training exercise held in Ukraine, according to the US Army. The combined exercise, which includes roughly 1,800 soldiers from 18 different nations, is meant to focus on defensive operations to ensure a safe and secure environment within the operating environment. This year's scenario consists of a host nation that comes under attack. The nation is able to defend itself at great cost. A multinational force is sent to assist the host nation and the challenge is to bring together and train a multinational brigade, which would then be sent to assist the host nation in its defense.